Despite the promise of a 2018 release date, Apple's long-awaited AirPower wireless charging mat remains unavailable, and almost all mentions of the device were last week removed from its website. This has prompted speculation over what could be behind the delay – and even whether the AirPower, which was announced over a year ago, will ever see the light of day. 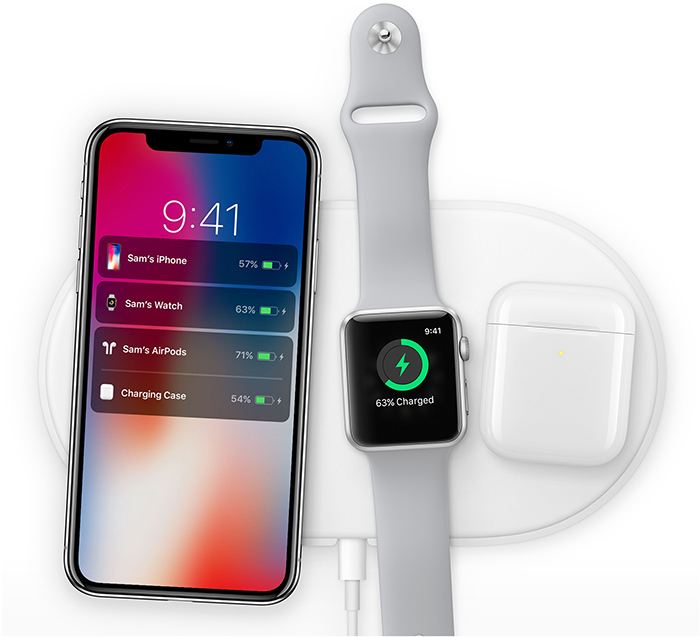 Previous reports have touched upon the technical issues Apple has run into with the AirPower's design, but a new report published on Sunday by Sonny Dickson claims several pieces of exclusive information that shed light on the challenges Apple is still facing with the device, which is designed to charge the iPhone, Apple Watch, and AirPods all at once. Currently the device produces far too much heat, which causes performance setbacks, and can affect the ability of the devices to charge if they become too warm in the process. It also affects the ability of Apple's custom charging chip, which runs a stripped down version of iOS, to function as intended. Apple's engineers have been experiencing both hardware and software issues with the communication between AirPower and devices placed on the mat, especially the communication of Apple Watch and AirPod charging data to the iPhone, which monitors the charge level of all devices placed on the mat. The mechanism being used for multi-device charging [21 and 24 overlapping power coils of various sizes] is proving extremely difficult to build or refine, and has been resulting in a significant amount of interference... which reduces the efficiency of the charging mat, and contributes to the heat issues that engineers are facing. Aside from heat and interference shielding, the report notes that the complexity of the circuitry in the device is also posing a significant challenge, which may not be overcome unless the device is redesigned to be slightly thicker and larger. However, Apple is said to be "unwilling to make compromises" on the AirPower's overall design. Wrapping up, Dickson holds out hope that the AirPower could still debut before the end of the year, but claims that "the broad consensus among engineers suggests that this is highly unlikely". Indeed, Dickson says chatter he's heard "less notable individuals involved with the project" suggest that the AirPower concept and trademark could eventually be applied to an all-new product with other unmentioned features, to be publicly shown at an undisclosed date "not likely to occur before Spring". For those who remain steadfastly optimistic about the AirPower, Apple has a few more months to meet its self-imposed 2018 deadline for the device, so it's still possible we'll see the device debut via press release in October, November, or December. I've not read the article, but you'd have thought they'd been like 90% of the way into testing before announcing this thing. Lesson: don't announce hardware products unless they are launch-ready. Personally I prefer this never launches than it launching as a sub par product. With that level of complication the price would be way beyond acceptable levels. Wireless charging as it is now I find completely useless. There is no difference for me if i place phone or watch on the mat or hook it up via cable. I charge overnight anyway. Not to mention that efficiency is very low what directly translates to loss of power. That technology is not promising. Once the real wireless technology will be available I will maybe change my mind. Lets say 3m range. I just re-watched the announcement. I feel like they weren't too confident. Schiller uses words like, "Want, "Think" and "Idea". "Our team wants to create something"
"We're going to give you a sneak peak of this Idea right now." "We think we have an idea of how to make this a better experience." He also put a lot of emphasis on how they wanted other manufacturers to innovate and push the limits on the standard. "But our team knows how to do this" but he may very well have been wrong. The overlapping coil design sounds great in concept, but coils that drive a signal creates a signal in other coils. Interference is the key word. This product may be physically (due to physics) impossible to build. I imagine spacing the coils out created dead spots. What good is a mat you can place your devices anywhere if there are dead spots? It’s not anywhere any more. Overheating means too much power loss in the coils. Inefficient means energy isn’t going into your phone or watch but instead is wasted. It also means slower charging. Apple was wise not to say anything about this product and has learned a lesson. Never promise a future product that’s not fully developed. Remember the 3GHz G5 PowerMac? Steve Jobs did. I don’t think it’s ever going to see the light of day. They're not really breaking any new ground here. Actually they are. This device would sense the location of up to three devices on a large open mat and intelligently direct energy to the individual devices, regardless of position. There is nothing on the market today that can perform that trick. Engineers: "We could get this to work if we made it a tiny bit thicker." Jony Ive: "Over my dead body."